Houdini Was a Steampunk Magician Before Steampunk! For my Steampunk friends, we all know the influence H.G. Wells and Jules Verne had on Steampunk. The Disney 20,000 Leagues Under the Sea movie also had a lot of influence on the genre. Well, imagine my surprise to discover that Harry Houdini was once approached to star in the original silent movie version of 20,000 Leagues Under The Sea. He turned it down because the studio wouldn't pay him enough but it's so wild that he was considered. Houdini was born Erich Weiss March 24th 1874 in Budapest Hungary. He was alive when Queen Victoria passed away. He began his career in the Victorian Age and blossomed as a superstar during the early part of the 20th Century. 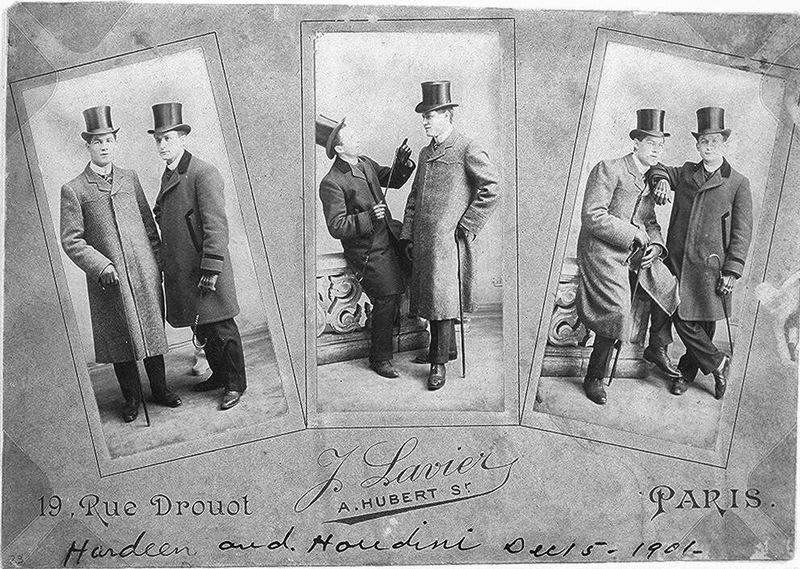 The photos above show a very steampunk looking duo, it's Houdini and his brother Hardeen sporting Top Hats, and not because they were both magicians, but because it was the fashion! And speaking of Steampunk Fashion, look at the Milk Can poster at the top of the page and notice the handle-bar mustaches on the three assistants. 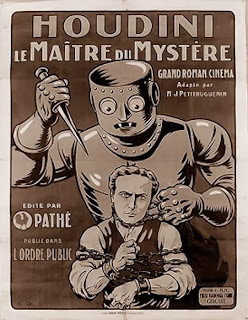 In the world of Steampunk Literature one of the popular themes are mechanical men, or robotic men or steam powered men. Well, it appears that ole Houdini was way ahead of us all. 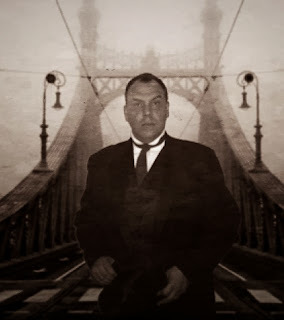 In 1919 he made a movie serial called The Master Mystery in which he played a character by the name of Quintin Locke. He works for the Justice Department and is investigating a cartel protected by a giant steel Robot. THAT is a Steampunk Robot if I've ever seen one. 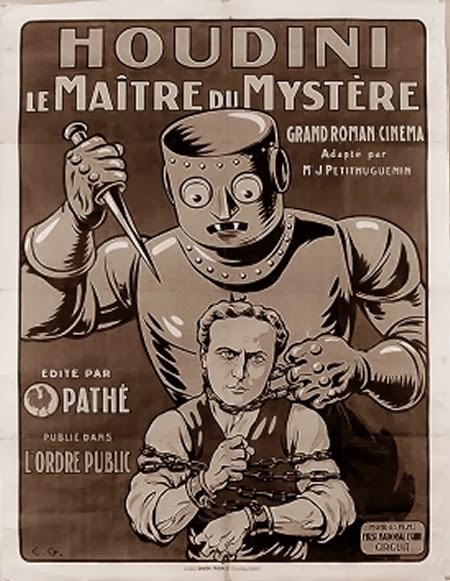 In the movie it is referred to as 'The Automaton'. An interesting aside, Houdini got his name from the French magician Robert-Houdin who was a clock maker, magician and builder of automatons. 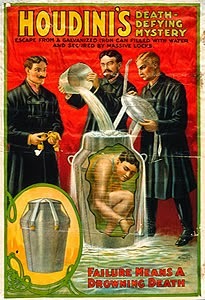 Now if there is any doubt left that Houdini was a Steampunk Magician, take a look at the poster below for his Water Torture Cell. Unlike the myth popularized in movies that Houdini died performing the Water Torture Cell, nothing could be further from the truth. He presented the WTC for many years and always successfully. That WTC is straight out of the world of Steampunk! And the one piece mens bathing suit also adds a touch of Steampunk as well. It's no wonder I found myself in this genre, I was inspired by one of the true Original Steampunk Magicians! Steampunk Magic Show by Carnegie Full Steam Ahead! say act, because we are only doing a short segment as part of the First Annual Houdini Festival in Danville VA. We have three things (maybe 4) in store for the show. One is an escape, the other two are routines we used to do but are being brought back. One of the routines was the creation of famed director Orson Welles, who was also an avid magician. His creation was later presented by Doug Henning and we presented in our show a few years back for a time. But now, we have revamped it and made it even better. The routine now has a time travel/teleportation element to the routine which makes it VERY steampunk. Because this is the Houdini Festival, we will also be presenting one escape in the show.